The applications are invited from the candidates for the most prestigious program, Global UGRAD 2019. 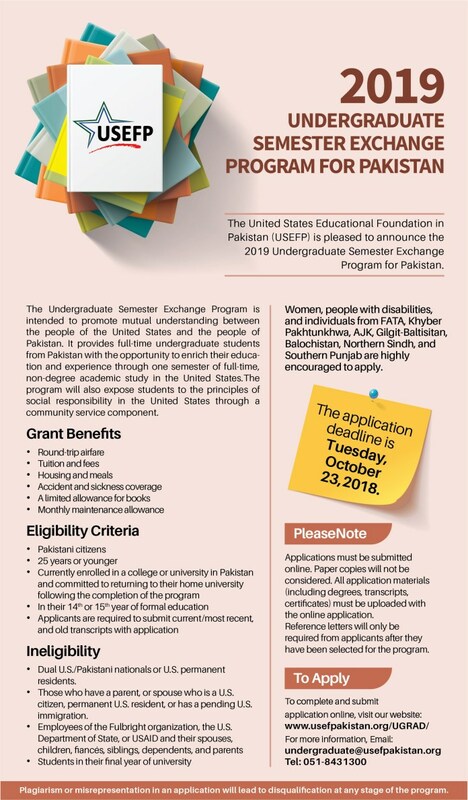 The global UGRAD 2018 is provided for the Pakistani students and the cost of the scholarships will be funded by USEFP undergraduate exchange program. The candidates do not need the passport at the time of applying for UGRAD program. The students do not need to have the IELTS / TOEFL for UGRAD. 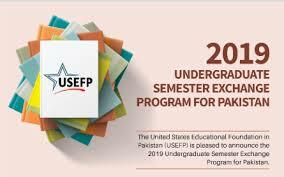 The USEFP Global UGRAD program is prepared to award the undergraduate Pakistani students, when they are enrolled at any university in Pakistan. Global UGRAD Pakistan program offers the cultural / academic exchange free study in USA for Pakistani students through the non degree program for semester at University in USA. The main purpose of Global UGRAD cultural exchange program is to promote the mutual understanding of the people of USA and Pakistan. Pakistani undergraduate students will spend about 4 to 5 months in United States. You will find everything including the samples of previous personal statements, previous alumni tips, previous alumni live webinar. You need to read full post and share the post with others. Approximately 250 Students will be selected. Two batches: Fall and spring semester. Duration: One semester – approximately half attend in fall and another half in spring. Grantees start studies: Fall next year. You will find previous personal statements of global undergraduate exchange program and you will find important links. You can get idea from these links and prepare the personal statement, which will play the important role in your selection. You can also find the list of the personal statement that made to USA. You can also find recent global UGRAD Pakistan live webinar with global UGRAD Pakistan 2018 current participant. The answers of all of the questions are given on this session about global UGRAD interview questions. They will provide round trip airfare tickets from your home city to United States. Tuition & Mandatory University Fee. Room and board, meals (breakfast, Lunch, Dinner) & Accommodation. A monthly allowance for other expenses. A limited Allowance for Books. Airport expenses around ($150) (It can be increased or decreased). They will give one credit card in which you will have $800. They will give one debit card, in which you will have more than $2500. Other Benefits including you travel to different States. You can do any type of Activities. Currently studying in a college or university and committed to returning to their home universities after completion of the program. The students, who are enrolled in four-year bachelor’s program or two-year bachelor’s programs, they are eligible to apply. Serious interest in learning about America. He must have high level of academic achievement, as indicated in grades, awards and reference letters. He must be proficient in English. Students from diverse backgrounds, especially who have not opportunities previously to travel internationally, are encouraged to apply. Note: Women’s, people with disabilities & individuals from FATA, Khyber Pakhtunkhwa, AJK, Gilgit Baltistan, Balochistan, Northern Sindh & Southern Punjab are highly encouraged to apply. Please note that applications must be submitted online. Paper copies will not be considered. All application materials including any degree, transcripts and certificates must be uploaded online. Reference letters will only be required from applicants after they have been selected for the program. The last date for Global UGRAD 2018 is 23 October 2018.